Is This a New Technique ? Sous-vide (/suːˈviːd/; French for "under vacuum") is a method of cooking in which food is placed in a plastic pouch or a glass jar and cooked in a water bath for longer than normal cooking times (usually 1 to 7 hours, up to 48 or more in some cases) at an accurately regulated temperature. The temperature is much lower than normally used for cooking, typically around 55 to 60 °C (131 to 140 °F) for meat, higher for vegetables. The intent is to cook the item evenly, ensuring that the inside is properly cooked without overcooking the outside, and to retain moisture. You can use the brewing equipment and design I've documented on this website to do sous vide cooking as it is able to hold temperature very accurately for as long as you like. No changes are necessary. 1. Fill the Mash/Lauter Tun (MLT) with enough water to cover whatever food you are cooking. 2. 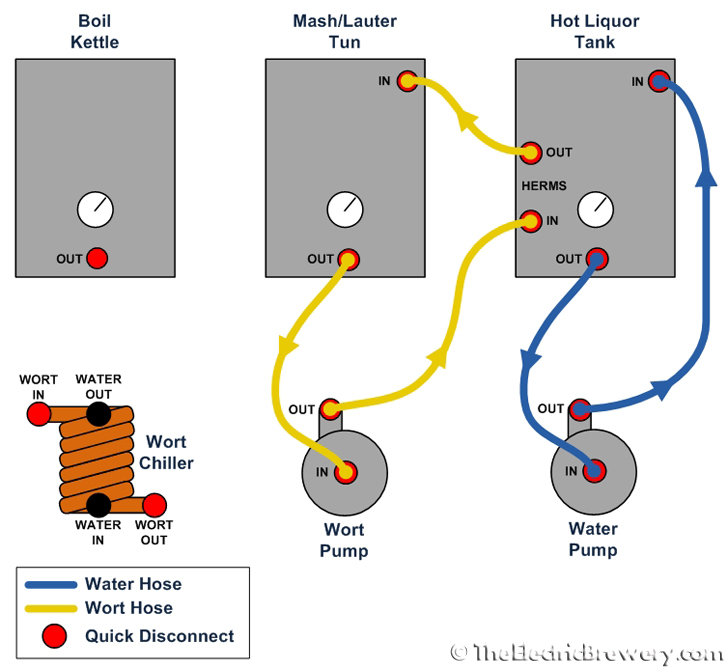 Fill the Hot Liquor Tank (HLT) with enough water to cover the heating element and HERMS coil. 4. On the control panel turn the WATER PUMP and WORT PUMP switches ON. Turn the ELEMENT SELECT switch to HLT. Set the HLT temperature to whatever temperature you want to cook your meat to. 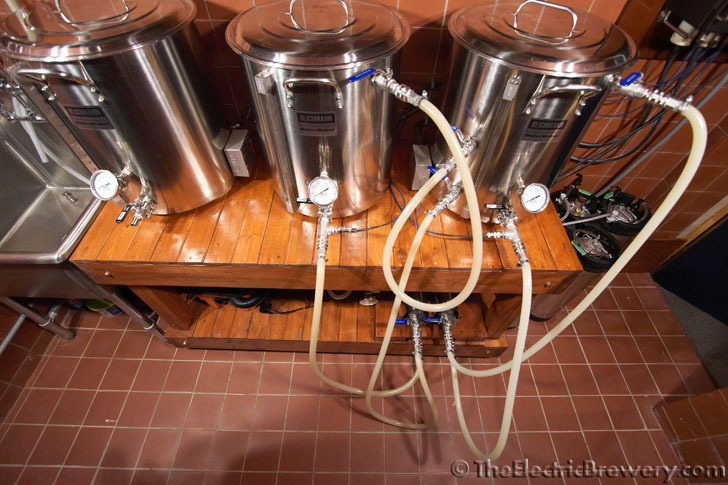 The water in the Mash/Lauter Tun will recirculate in the HERMS coil and the temperature will heat up to your desired temperature and hold there. Add the meat to the MLT and cook as long as the recipe calls for. Once done there is no cleaning required as the food was in a sealed bag such that only water touched the MLT and HLT. You used a small Anova sous vide heater to do step mashes? I don't see how this could work very well as it doesn't have a pump strong enough to push through the grain not to mention that it's not actually pushing or pulling through the grain. There's no mention of using a temperature probe to measure the grain bed temperature so I'm assuming that when temperatures are mentioned that they are mentioning the appliance temperature. That is the water temperature and not the grain temperature. So these steps that are mentioned would not have actually worked as they expected. Our second step, the saccharification rest, required a rise in temperature to 148F. The Sous Vide preformed this beautifully and accomplished the 26-degree temperature rise in about 5 minutes. Except that it most likely did not. Or, should I say, the writer is not understanding how this should work and what they are seeing. I'm assuming that the 26 degree rise was what they saw on the sous vide appliance. This means the that the *water* around the grain raised by 26 degrees in 5 mins, but the grain bed never would have done that. It's the grain temperature that matters. The recirculating device in the sous vide appliance is not able to push the water through the grain bed - that's not what it does. It simply heats the water around the sack. The appliance does not push or pull water through the grain bed so it would take forever to ramp up the actual grain temperature. Another example: During mashout it's mentioned that went from 148F to 168F and held for 10 mins. What they mean is that the water went from 148F to 168F. By the the time the water reached and held at 168F for 10 mins I doubt the grain bed was even at 160F. It was probably still in the low 150s in the center of the grain bed. The outside would be close to 168F however. Eventually, yes, set the appliance to (say) 168F and the entire grain bed will reach 168F as the heat would leak into the center of the grain bed in the same way as it does into the food when you cook sous vide, but that takes a long time. So the way the article is written is most likely incorrect/misleading as it makes people think that they can do step mashes using a small appliance like this in a quick/efficient manner. Redo the experiment with a temperature probe directly in the center of the grain bed and I bet you will see a completely different story and that the steps and temperatures are not behaving at all as you would hope. That's the temp that matters. This is why brewers use pumps to push water *through* the grain bed, even with recirculating BIAB setups. An appliance like this can be used to maintain mash temp as it'll eventually get there through the heat seeping through the grain bed. So it's good for a simple single step saccharification rest, but this cannot work well for step mashes, especially short duration ones as is written. You need a properly circulating setup if you want to do steps efficiently.